Metropolitan area codes with 952 in red. A map of Minnesota area codes. 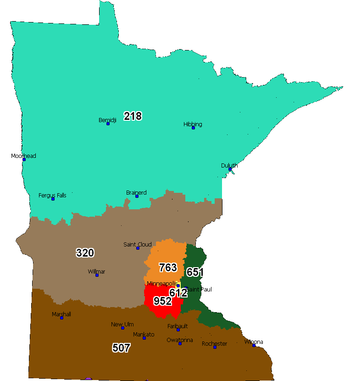 Area code 952 is the telephone numbering plan code in Minnesota for the southwestern suburbs of Minneapolis-St. Paul including cities such as Bloomington, Eden Prairie, Edina and Minnetonka. It was created in 2000 along with area code 763 (northwest suburbs) when they were carved out of area code 612, which now only contains Minneapolis and a few inner-ring locales. 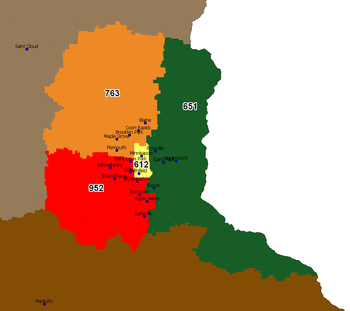 The area code splits in the Twin Cities are unusual because they split along municipal, rather than central office, boundaries. This led to a sizeable number of exchanges being divided between two area codes. One central office, the Penn Avenue office in Minneapolis, had its geographical territory divided into area code 612 for portions in Minneapolis; 763 for portions in Golden Valley; and 952 for portions in St. Louis Park. Competitive local exchange carriers serving large portions of the metro area also ended up serving three area codes with the same prefixes. 952 is bordered on the north and northeast by 763 and 612 respectively, on the east by area code 651, and by area code 507 to the south. This area is in the Central Time Zone. The four Twin Cities area codes (612, 651, 763 and 952) comprise one of the largest local calling areas in the United States; with a few exceptions, no long-distance charges are applied from one part of the Twin Cities to another. Portions of area codes 320 and 507 are local calls from the Twin Cities as well. ^ "NANPA Planning Letter PL-200: 612 NPA Split, Creating 763 and 952 NPAs - Minnesota" (PDF). 1999-11-29. Retrieved 2007-10-26.